The Fixed Gear World: #PRODUCTREVIEW | Goliat Daybreak "Born in nature"
#PRODUCTREVIEW | Goliat Daybreak "Born in nature"
Today we want to show you our review of a new brand of fixies and single speed bikes called Goliat Bikes, specially our review of the Goliat Daybreak, a customized through a artisanal painting process that mimics shapes, colours and textures found in nature, in this case pine wood. You open your eyes, you have just woken up. A beam of light goes through the window. Twenty-four hours ahead to enjoy your Goliat Daybreak. A machine made for pleasure. You get around the city fast. You pedal, brake, give way, breathe. You are surrounded by cars, motorcycles, buildings. The traffic light shows yellow light, you then grip firmly the handlebar, you look at the Goliat’s pine-wood veins and you feel as if you were somewhere else… you pedal. That's all! A fixie (or single speed, you choose) designed for city, but remembering us our origins in the wood as skin of our bike...really nice and genuine! The Goliat Bikes are customized through a artisanal painting process that mimics shapes, colours and textures found in nature. The bicycles are developed following the concept of “Born In Nature” which aims to bring nature to the city. 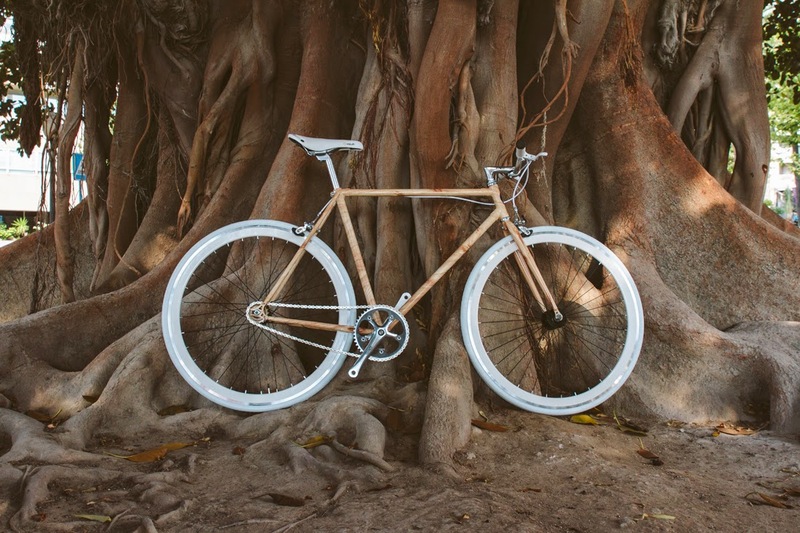 In its Wooden Series, Goliat Bikes offers three different bicycles that mimics wood tones: Daybreak (pine), Noon (cherry wood) and Twilight (ebony).